On Wednesday, January 31st, 2007 this gift set arrived. 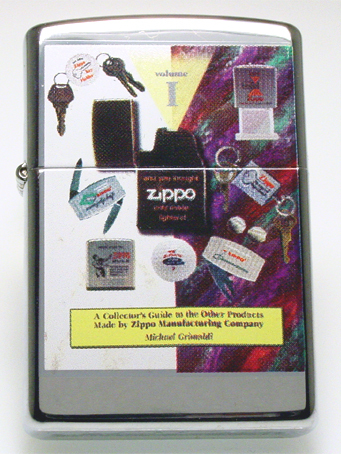 showing the cover of "And You Thought Zippo Only Made Lighters - Vol 1"
accompanied by a Ziplite insert, a business card and coa. click: [7:05] Good evening and welcome to the Click Chat with charter member Mike Grimaldi. 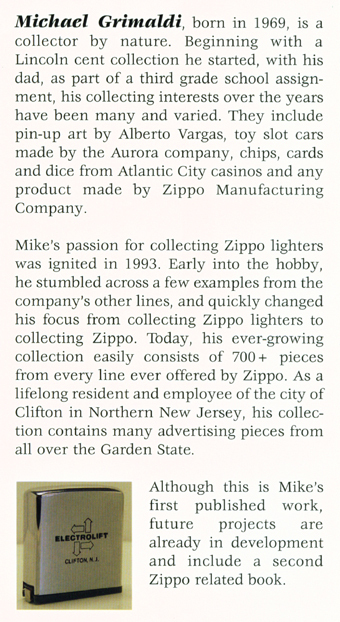 Mike is the author of the newest Zippo collecting book, And you thought Zippo only made lighters: A Collectors Guide to Other Products Made by Zippo Manufacturing Company released at the Zippo/Case International Swap Meet in July. Welcome Mike. 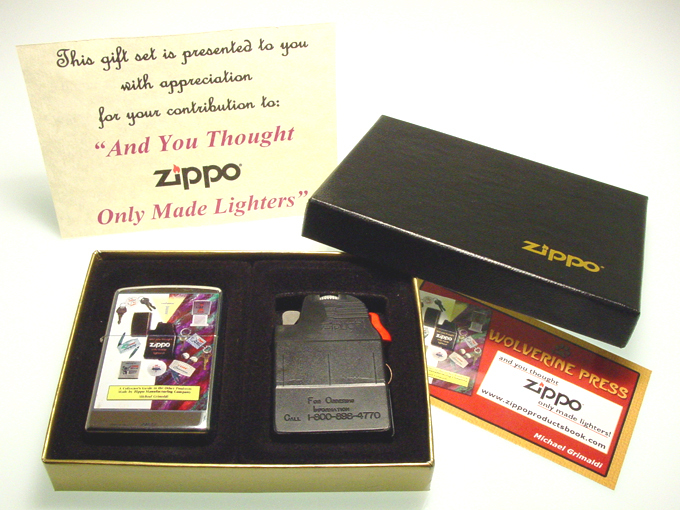 Can you tell us a little bit about yourself and how you got started collecting Zippo products? rbdabberrb: [7:05] Hey Click, Hey Mike - we're already begun! click: [7:07] What made you decide to write the book? rbdabberrb: [7:07] and how many pieces are lighters and how many are non-lighters? click: [7:07] Is it a limited edition book? click: [7:08] Does anyone have any questions for Mike? zippocan: [7:08] hello and it's great to have you all online. Mike; about 30 years ago I got a ZIPPO tape that has an acrylic face encompassing a rose. Are these a standard release? rbdabberrb: [7:09] Do they make ultralite rules anymore, do you know? rbdabberrb: [7:10] Also, in your humble opinion, what piece will be the most collectible other than those produced for a short time? rbdabberrb: [7:11] Ah, okay, tease us with what is yet to come in Volume II!!!! rbdabberrb: [7:12] Speaking of imprints, were any pieces produced using the Town & Country process? click: [7:12] Hey there Len! rbdabberrb: [7:14] Mike, what was the most enjoyable part of doing your book? Obviously, it was a long, long process, etc. rbdabberrb: [7:15] We just bought a hand warmer at Smoky Mountain Knife Works Click Together; I don't think I'm allowed to use it! rbdabberrb: [7:16] People with some great pieces it looks like by the pics in your book, ha! rbdabberrb: [7:17] did you swap any pieces?!?! zippocan: [7:17] Wish I could hang around but duty calls. Thanks all. Catch you in the forums. rbdabberrb: [7:17] See ya Can! rbdabberrb: [7:18] I have a whole list of questions, so don't let me monopolize the conversation!! rbdabberrb: [7:19] What was the hardest section in your book complete? bummie: [7:19] Have any HD's (Harley Davidson) been produced on tapes, etc. ? bummie: [7:19] Have any HD's been produced on tapes, etc. ? rbdabberrb: [7:20] That would make sense; trying to find documentation, folks who were "there"
rbdabberrb: [7:20] Ron... are you listening to this? Do you have any? bald_guy: [7:20] knives and ink pens, HD’s? rbdabberrb: [7:22] teaser teaser, okay, keep going, what else will be in Volume II; if it contains anything close to the wealth of info in Volume I - we can't wait! camelmanlen: [7:23] Will you be doing a Zippo book cover lighter of that one also? rbdabberrb: [7:24] but the zipper wax was produced for OUR company, right? bummie: [7:25] And the Contempo? rbdabberrb: [7:25] do you know what timeframe the lip balm and zipper were done? zippolover: [7:27] Hi! I am new to collecting and have a question about the date stamps... should the stamp on the case match the one on the lighter? bummie: [7:27] Now all I need is a blue flame! rbdabberrb: [7:27] Len, do you have any non-lighter Camel pieces? rbdabberrb: [7:29] If you get a lighter which has a "newer" insert in an "older" lighter, the insert was probably replaced. click: [7:29] rbdabberrb...your book - the first Warman's Zippo Field Guide is another great resource book! rbdabberrb: [7:30] Can we send pictures on this chat? haha! rbdabberrb: [7:30] Wow, very collectible then! rbdabberrb: [7:31] Mike, you said you had about 900 pieces; how much of your collection is non-lighter? zippolover: [7:31] I bought some newer ones on eBay and received with an older but still new insert. zippolover: [7:32] does value go down? rbdabberrb: [7:32] Mike, any plans for a book after Volume II? some have been saved for "sometime before I die"
rbdabberrb: [7:34] figures.... okay, we have some rules, knives, etc. rbdabberrb: [7:34] what do the rest of you have in the way of non-lighters? 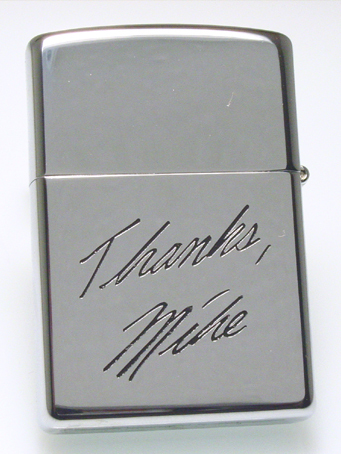 click: [7:34] Mike, one of my favorite non-lighter Zippo products is the Zippo Pill Box. When did they discontinue those? rbdabberrb: [7:35] okay! we only have one belt buckle. rbdabberrb: [7:35] and only one pill box. click: [7:36] What price range should I expect to pay for one now? rbdabberrb: [7:37] If you said this already, I'm sorry - what years were pill boxes produced? click: [7:37] Sounds like a good gift for Santa to bring me! bald_guy: [7:38] as was the collector book style case? rbdabberrb: [7:40] we only have one; they are really kewl beans. rbdabberrb: [7:40] and discontinued about when, Mike? rbdabberrb: [7:41] no problem; but like you say the main ones I see are military. rbdabberrb: [7:42] wow, later than I would've thought then. rbdabberrb: [7:43] more so than lighters? click: [7:44] Does anyone collect Zippo rules? rbdabberrb: [7:44] which brings up another subject - any "new" non-lighter products being introduced? rbdabberrb: [7:44] Yes, we do! rbdabberrb: [7:45] As seen in Mike's book, there are some awesome advertising rules to be had. click: [7:47] I mean...now the lighter stand is available at the ZCVC and online at Zippo.com. click: [7:47] Did anyone pick one up at the Swap Meet? click: [7:48] We're gearing up for the 75th Anniversary so there's plenty of non-lighter products coming for the celebration. kdsinc1: [7:49] will these products be coming out during the year? click: [7:49] Yes, some are available now at the Visitors Center but there will be plenty next year. click: [7:50] Including a 75th Anniversary bar stool! rbdabberrb: [7:50] Got kicked off. click: [7:51] The 75th Anniversary Pilot run is beautiful...did you order that? bald_guy: [7:51] the bar stool ? Robin? rbdabberrb: [7:51] Ordered 10 of the magnetic lighter holders. so glad to see them available on line! rbdabberrb: [7:52] Mike, Kathy, will the lighter holders be available for imprint? click: [7:52] Great idea but not available imprinted at this time. click: [7:52] I'll pass that idea on to promotional products! click: [7:53] We're test marketing them online right now so we'll see how you all like them. rbdabberrb: [7:53] One kinda weird question for Mike - will Volume II have the same cover? there are no plans as of yet . rbdabberrb: [7:55] I wish they would; they're a really great "Zippo" product to get friends for presents. Everyone needs a flashlight in their pocket or purse. rbdabberrb: [7:56] Will any non-lighter piece be produced for the 75th? click: [7:57] Mugs, pins, shot glasses, clothes, lighters, fa....ooops that one is a surprise, sorry can't tell! bald_guy: [7:58] was there a topic in the forums discussing battery replacement for zip lites ? bald_guy: [7:59] Mike, do you know the voltage of the lite? rbdabberrb: [7:59] Mike, before the live chat ends, just want to say thank you so much for the time and effort you put in to produce a book which really needed done - and you did it beautifully!! I have no idea, bummie? rbdabberrb: [8:00] green ick and all that..
click: [8:00] Other than the Zippo/Case Visitors Center, where can members purchase your book? click: [8:01] Can they have it signed by you to make it more special and collectible? rbdabberrb: [8:02] and what a great "coffee table" book for a gift. Yes, we'll take another one, ha! rbdabberrb: [8:03] Good night, all - and THANK YOU for joining in this chat and THANKS Mike and THANKS Click! click: [8:04] We look forward to another chat with you in the future! click: [8:04] Thank you everyone for joining us! bummie: [8:04] Great book. Great Content. Great author!!! camelmanlen: [8:06] Kathy, will this chat be posted somewhere? click: [8:07] Yes len, I'll get it posted in the forums under Live Chat tomorrow. Welcome to our first chat of the year. 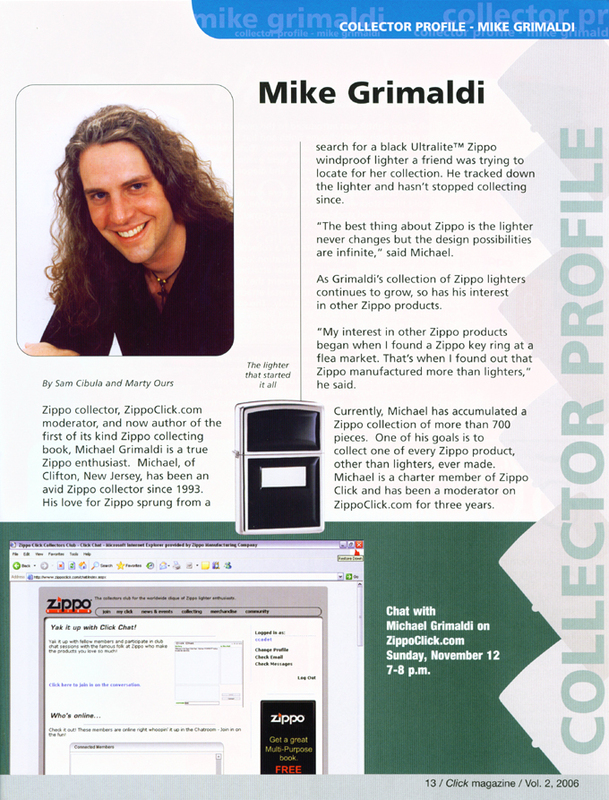 Today, we’re chatting with Mike Grimaldi who is a Zippo collector, ZippoClick .com moderator, and author of a two-volume Zippo collecting book series. 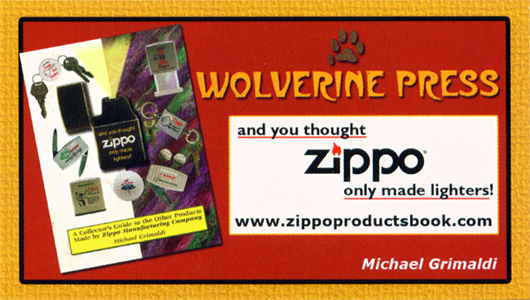 As reviewed in Click magazine, Mike's book: "And you thought Zippo only made lighters. 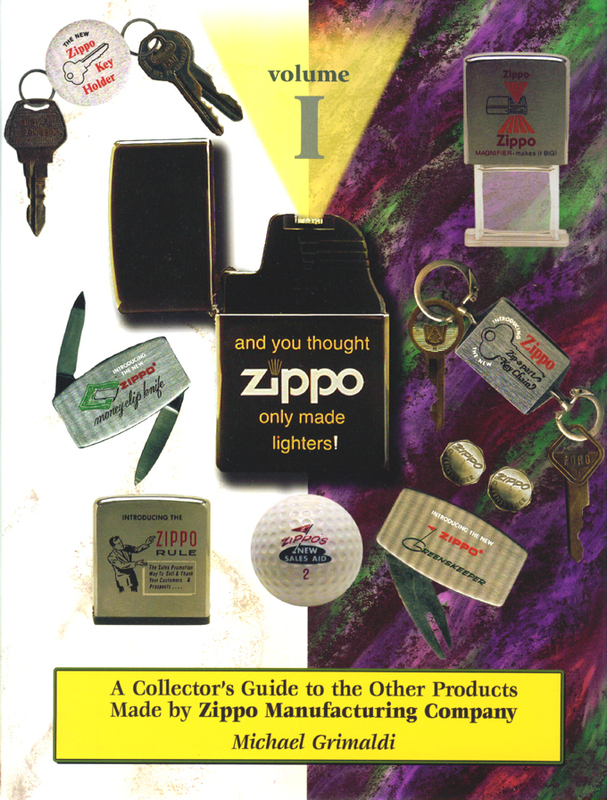 A Collectors Guide to the Other Products Made by Zippo Manufacturing Company” focuses on all of the non-lighter products Zippo has produced during their rich 75-year history. 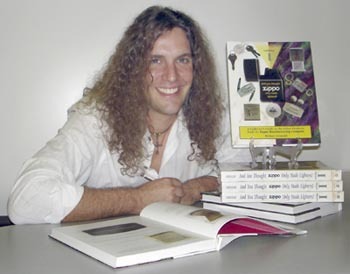 Mike will now field your questions regarding Zippo's many non-lighter product lines, his first book, and what we can expect from the second volume slated for release this summer in Bradford during Zippo's 75th Anniversary Celebration. click: [12:09] Mike, thanks for coming back for another chat. kdsinc1: [12:10] It's currently going through final revisions and if I do say so myself ...looks awesome! 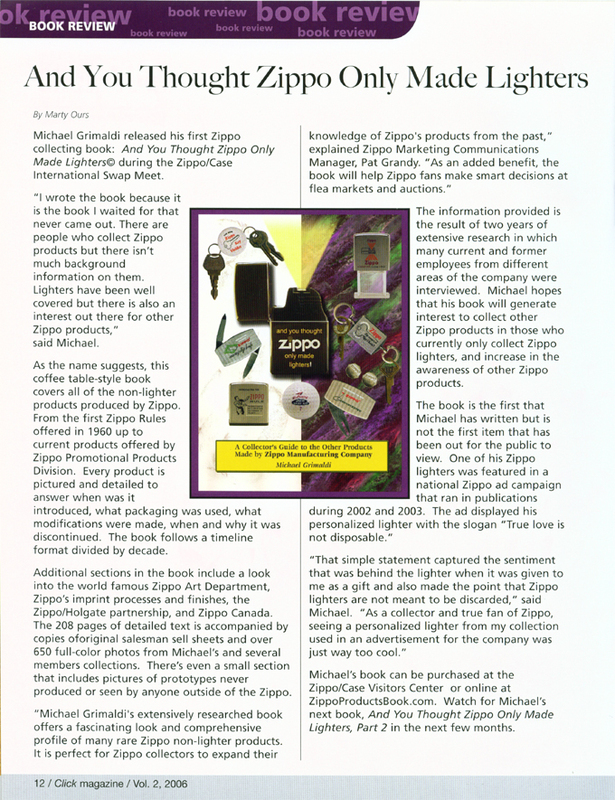 click: [12:10] I know we've sold many of your books at the Zippo/Case Visitors Center and online too. click: [12:11] What categories are in the new book. rbdabberrb: [12:11] I don't have Vol 1 in front of me, so what years will Vol 2 cover? glenhopkins: [12:11] Mike, can you give us some idea of the products it will cover? kdsinc1: [12:11] Vol. 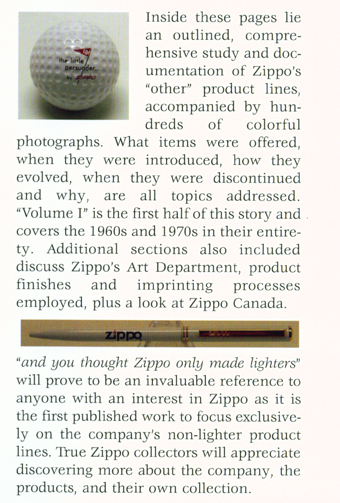 II begins at 1980 and covers the catalogs right up to 2007! garywhyman: [12:12] Surprise! I made it! Welcome everyone who's already here! click: [12:13] gary - good to have you join us! garywhyman: [12:13] Plans change! Sometimes for the better! Good to be here. Good afternoon everyone! kdsinc1: [12:13] anyone familiar with this product? rbdabberrb: [12:13] 13" ruler.. same as the rule we're used to seeing? garywhyman: [12:15] Why such a short production run? arthurdent: [12:15] folding or reel type rule? rbdabberrb: [12:15] shorter production time than the zip-a-part..
click: [12:19] Mike, what inspired you to collect non-lighter Zippo products and how did you gain all your knowledge about them to write two books? rbdabberrb: [12:19] Mike, I have a question - there is a card included in the ZipLight 1st production run for employees. Does the inside of the card have any printing on it? 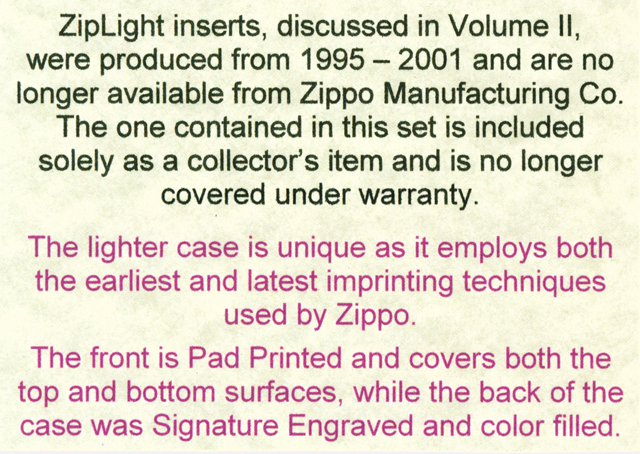 glenhopkins: [12:21] Mike, Any Idea of the last production date for the Ziplight?, I picked up an "E-01" Boxed with matching insert this week. garywhyman: [12:22] Will we ever hear the details about the flint wheels that had "Z I P P O" engraved/stamped on them? rbdabberrb: [12:22] Do you know what I mean? The card, yes, you can read that, but I'm asking if the card opens up, if you were to take it out of the original packaging. rbdabberrb: [12:23] duh. I should've known. Thanks. glenhopkins: [12:24] There is a tobacconist near me who still has one for sale!! kdsinc1: [12:28] anyone notice any differences between the inserts? glenhopkins: [12:28] What about the Constant light, I see a lot on Ebay as "Discontinued" - is it still in production? glenhopkins: [12:29] The later one is overstamped with two dates? rbdabberrb: [12:30] One more question about the ZipLight 1st production run - is there any way to get that darned packaging open without ripping it to shreds? kdsinc1: [12:31] I would take a razor blade and carefully slice the plastic just enough to get at it. andyzip: [12:31] the 6in1 constant light is hard to find with company advertising but I liked the idea a lot, especially for the easy changeable batteries. rbdabberrb: [12:33] I can't count the folks who have seen ours and said they'd love to get some for their children, for gifts, etc. rbdabberrb: [12:33] I'll be dagged. What's the first? click: [12:34] Send your letters of request for new products to our Consumer Relations Department! rbdabberrb: [12:34] Thanks, Click - will do! click: [12:34] Consumer Relations gathers information about requests, problems, etc. and takes them to the folks that need to know. click: [12:35] I'd like to see the Pill box again...in pretty pink colors! I'll write the first letter! rbdabberrb: [12:36] Mike, what is your personal favorite item/section in Vol 2? rbdabberrb: [12:37] Does everyone here own a pill box? rbdabberrb: [12:37] Will look forward to reading about the knives! rbdabberrb: [12:38] we only have one, too, but it's a double sided trucking advertiser! rbdabberrb: [12:38] Ron, look under your couch, I'm sure you have one somewhere. arthurdent: [12:39] other than induce the headaches! arthurdent: [12:40] darn straight Mike! 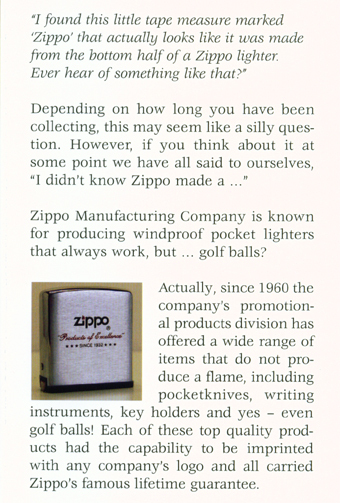 camelmanlen: [12:40] did zippo ever make a hand warmer before the ones that are out now? kdsinc1: [12:41] has anyone tried the new one yet? rbdabberrb: [12:41] New pill box? rbdabberrb: [12:42] We have a hand warmer, but Dana won't let me take it out of the box. rbdabberrb: [12:42] Silly, it's a collectible! kdsinc1: [12:43] that's why we buy two! rbdabberrb: [12:43] I know.. I know..
rbdabberrb: [12:44] Yes, there are a couple nice things in the 2007 catalog! rbdabberrb: [12:44] Also, want to ask if anyone who has a Zip-A-Part keychain has broken it when they tried to pull it apart. rbdabberrb: [12:45] too numerous to mention! garywhyman: [12:45] The 2007 Catalog just about hurt me! rbdabberrb: [12:46] Welp, that answered that question. We'll just admire..
rbdabberrb: [12:47] Mike, can you tell us approximately how many pics will be in Vol II? kdsinc1: [12:50] has anyone ever seen a Zip-Chute? garywhyman: [12:50] Mike, could you say that your sources of actual items lies more with people who worked at Zippo, or avid (lucky) collectors? hengilinov: [12:50] whats a zip-chute? garywhyman: [12:51] I've been to the ZCVC maybe 15, maybe 20 times.... and I have to beg stupidity... What's a Zip-chute? rbdabberrb: [12:56] naw, they're lighters. kdsinc1: [12:56] besides I think Robin covered them didn't she? click: [12:57] ...and Robin, when are you and Dana going to write your volume 2? rbdabberrb: [12:57] So, Mike, your book is in its final stages, you're starting on a 3rd - what else do you have in the works? click: [12:58] For those new collectors that joined us, Dana and Robin Baumgartner are authors of Zippo's first "Warman's Field Guide" released last year. garywhyman: [12:59] Do you realize how challenging it is to do 'filing' while reading these lines and laughing....? rbdabberrb: [12:59] Ah, thank you so much for the kind words. We enjoyed it, as Mike is enjoying his projects. rbdabberrb: [1:01] now WE can't either and we don't even know what we're waiting on, ha! garywhyman: [1:02] I would love to see an article in the Click about the WGI Zippos. 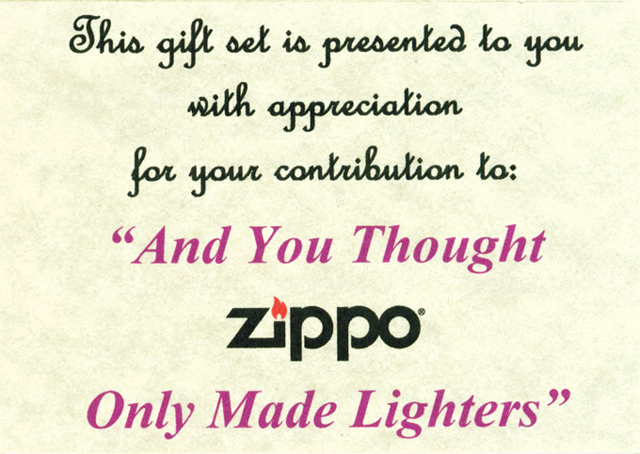 There are some amazing lighters out there that no one but Zippo execs, guests, and special friends can attest to. Peggy? Kathy? click: [1:03] That's a great article idea Gary ...I'll see what Peggy can gather...she's got a nice collection! rbdabberrb: [1:05] Thanks Mike! Thanks Zippo Click! click: [1:05] Thank you everyone for joining us today. It's always fun to Click Together whether in a live chat or in person. garywhyman: [1:05] To all... thanks for the chat. It was stimulating! :o) Especially Thanks to Mike, Kathy, and Robin & Dana. rbdabberrb: [1:05] Happy Birthday Andy! andyzip: [1:06] thanks Robin !!!! kdsinc1: [1:06] is it today Andy? click: [1:06] My pleasure - this is a great way to spend a Sunday ...with all of you. Thank you all. click: [1:06] Happy birthday Andy!